Regular readers know that I’m born and bred an Okie. I don’t believe I even left the state until I was sixteen when my family moved just across the border to DeQueen, Arkansas where I graduated from high school. After that, I lived in Texarkana, Texas awhile, graduated from TCU in Fort Worth, meandered around Germany for a year or so with the US Army before being shipped to Colorado. After discharge from the military, I took work in Denver where I met and married my wife Betty. Denver was okay, but I wasn’t enamored of it as many people are. So I wasn’t disturbed when my company transferred me to Albuquerque, New Mexico. I still remember topping a hill and seeing the city spread out in the distance. I loved it instantly. It took her about a year before she lost the urge to return to Denver. Over time, my liking for my adopted state has only strengthened. I hope that comes through in my writing. I try to highlight different areas of New Mexico in each novel. I’ve reproduced some of my treatments showing that respect below. The Sangre de Cristos to the north and the Jemez Mountains on the west stood like massive, mute sentinels. An unforgiving sun high in the cloudless sky bleached the desert landscape brown and turned Interstate 25 into twin ribbons of glistening black tar. The white four-door Impala barreling down the highway pushed the speed limit—not enough to attract the attention of passing cops but sufficient to clip a few minutes off the hour’s drive to Albuquerque. I picked up I-25 South and exited at Central Avenue, turning left up the long, steady climb to the heights. 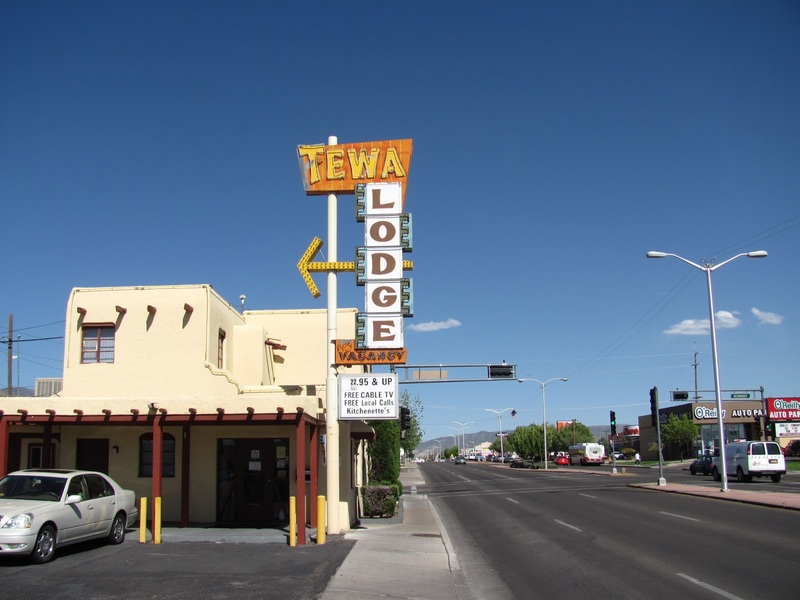 Central was once touted as the world’s longest main street and had been a stretch of the famous Route 66 before Eisenhower’s interstate highway program did it in. Now lined with one-story brick and stucco antique shops, cheap motels, bars, and adult bookstores, Central was well past her glory days, but she still put on a flashy show of neon lights by night. Inevitably the morning sun exposed her timeworn wrinkles and sagging frame. I had intended to use this time to think. Instead I found myself examining the venerable old gal. The impressive campus of Presbyterian Hospital showed signs of recent construction, but then it usually had something underway. The University of New Mexico was a beehive of activity. Apparently some sort of musical performance at Popejoy Hall had ended, and cars were now spilling out of the side streets. The trendy Nob Hill Mall, with its boutiques and outdoor cafés in the Midtown area, drew college students and young adults from every walk of life. I motored past the sprawling and aging New Mexico State Fairgrounds, where a weekend flea market, in-season horse racing, and daily casino operations attracted gamblers, drunks, touts, and prostitutes of both sexes. Back in the days when I was a street cop, this area and the rabbit run a little farther to the west had dealt me more trouble than anywhere else. I’d pinched more than one thief trying to sell his loot in the flea market. I’d faced down a distraught family man who’d gambled away the mortgage money at the racetrack and was determined to commit suicide by cop in the parking lot, but thank goodness, my partner and I talked him out of it. If you haven't read Zozobra yet, I encourage you to take a look at it on Amazon. I believe they allow you to read a significant portion of the book on-line. Central Avenue sounds seedy in the above. But that’s all right. Parts of it are seedy. A wonderful seedy that gives you an insight into the days when it was part of the fabled Route 66 that stretched clear across this nation. 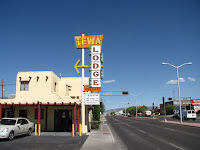 Eisenhower’s interstate highway system might have done it Route 66, but so far, it hasn’t appreciably altered Albuquerque’s Central Avenue.